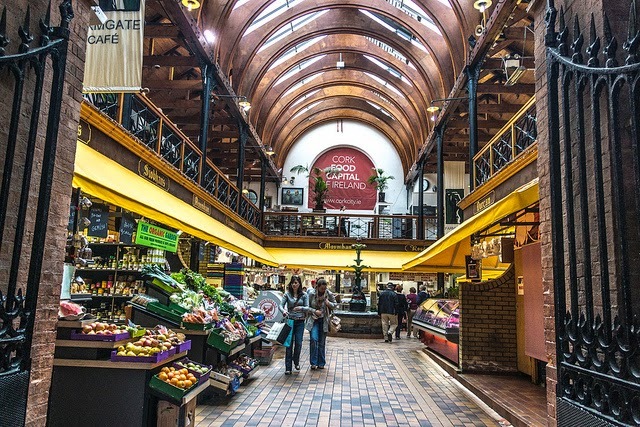 I took a trip to The English Market in Cork city this morning. This is just the most wonderful place. Walk up the busy main street and enter into a world of food and spices and aromas! Filled with counters and stalls of meats and fish; spices and sauces; treats and sweets; olives and pestos; breads and cakes…………..It’s fantastic. The aromas and smells walking through here are divine. And the colours are amazing. I highly recommend it. Even if you’re not intending to buy anything, just take a stroll through. You can browse and taste or just sit at a café counter and sip on a coffee, watching it all go on. I love looking at the variety of produce in there. I walk in and am immediately greeted by the aroma of Asian spices and oils. I first walk through a stall selling everything from fresh fruit and veg to herbal supplements and oils. I buy some Cacao powder for baking. I spot a group of eager buyers at a stand and of course curious as to what is so interesting I too join in. I’m at a stand with bowls and bowls of olive varieties and cheese and pestos. I browse through all the different types of olives with their marinades and taste test some. They are big and juicy and so flavoursome. My turn has come and I buy some very tasty garlic and herb green olives. I take a turn and enter into the fish section. Only a relatively new comer to a love of seafood, I’m still finding my way and the smell is quite overpowering for me. But it is an amazing site. The amount of fresh produce here is amazing, all displayed with careful imagination. The fish mongers have great banter across at each other here putting on a spectacle for the passing public. Fresh breads and baguettes greet me on a counter corner……The variety is amazing. The ingredients are so varied. The aroma is wonderful……I welcomed smell for me after the fish section! There is a counter that makes and sells chocolates. The site is truly amazing. The different varieties and colours is mind blowing….hundreds and hundreds of single truffles and chocolates adorn there cabinet display. Resisting the temptation is tough! I end my venture through the market by purchasing some curry paste at an Asian stall. I had got some of these some time ago but had run out. They are delicious combined with some coconut milk and I am delighted to have them back in my press again! Back out onto the street, I am grinning to myself with content. It truly is a fantastic experience to any food lover.